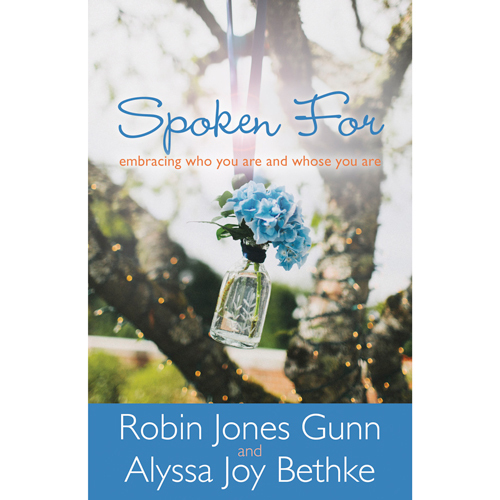 What a great pleasure it was to read Spoken For by co-authors Robin Jones Gunn and Alyssa Joy Bethke. The subtitle, embracing who you are and whose you are, encapsulates what the book is about. In each chapter, both Robin and Alyssa, share from scripture about what God thinks about you as a child of God and the bride of Christ. The chapters tell you are wanted by God, pursued by Him, loved, have been called, are of great value, a peculiar treasure, set free, covered, promised and spoken for. What I especially appreciated about the book is how transparent both authors were about what we feel inside about our worth, desires and insecurities. They openly shared and were vulnerable about painful times in their own lives that included rejection, loneliness and the resulting pain that doesn’t go away and can continue to impact us years down the road. There are some real gems of wisdom in this book. I wish I had this book when I was a new Christian and learned to see myself through God’s eyes and not through the broken mirror of this world. I highly recommend this book for young Christian women, teenagers, and even older women. Goodness knows we don’t escape this life without incurring much pain. I think this book can be used to begin healing the scars from the past and helping girls and women to make better choices because they can have confidence in who they are in Christ. As I was reading Spoken For, I thought of a number of girls and women who could benefit from this book. Don’t just buy one copy, but get a second copy because you will want to pass it along. Spoken For is a book I will definitely read again. I would like to thank the people at Blogging for Books for supplying me with a copy of Spoken For to read in exchange for an honest review. I was under no obligation to give a favorable review.